Our eco-friendly nature excursions offer you the opportunity to witness the breathtaking bio-diversity of the Bahama Islands’ vibrant ecosystems. Our expert naturalist guides will lead you to discover the incredible assortment of the flora and fauna that inhabit the wilds of the Bahamas. We offer some great tours of the interior of these beautiful islands. 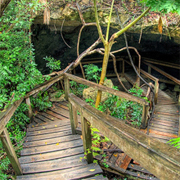 If you are staying on Grand Bahama Island, you can venture into Lucayan National Nature Reserve where you can investigate portions of the massive elaborate cavern system -- one of the most expansive on the globe. The pristine portions of the Bahamas, like within Lucayan National Park, offer nature lovers plentiful pine forests, and mangrove tangles. The Bahamas are home to a splendid spectrum of tropical and aquatic bird species, including Antillean Pee Wees, West Indian Flamingoes, Red-leg Thrushes, Striped-headed Tanagers, the threatened Bahama Parrot, amongst others. You’ll be serenaded by a symphony of melodies from song birds as you explore the wilderness. Near the shore you may find plentiful verdant foliage that opens up to reveal unspoiled white stretches of beach and the brilliant blue waters of the Caribbean Sea. These islands are home to a vibrant and diverse array of exotic plant and animal life. The waters that surround these islands are bustling with marine species. 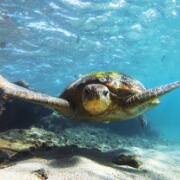 You’ll be astounded by the amazing assortment of aquatic species that inhabit these waters, including Sea Turtles, hard and soft corals, Dolphins, Mantas, crustaceans, mollusks, and an incredible spectrum of tropical fish. A trip to the Bahama Islands is a nature lover’s dream. 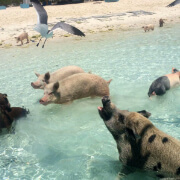 We invite you to come with us for a full day adventure down to the Exuma Islands where you'll get a variety of experiences, including swimming with the famous swimming pigs! Our 40' powerboat is perfect for this trip, only fitting you and up to 14 others on board for a more personalized feel. 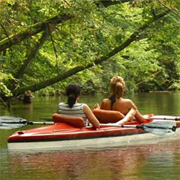 Get an island experience like no other with this fun, exciting tour! See how we do it while sightseeing, snorkeling prime coral gardens, and enjoying time at one of our most beautiful beaches. Taste some famous local favorites conch fritters, conch salad & more, and cool off in the turquoise oasis that lines our coast. The Bahamian waters are a genuine paradise for snorkelers and we offer a snorkeling trip that you will not soon forget. Take advantage of a customized diving boat, state-of-the-art equipment, and knowledgeable staff and explore underwater wonders. Learn about ancient life on Grand Bahama Island, as you explore timeless Lucayan National Park. Our guides will lead you through an unspoiled forest and then into the depths of an intricate system of caves, while you learn about the people who populated this island before the arrival of Columbus. Clear blue water and unique ecosystems await you on this nature-packed kayak tour of Lucayan National Park. Float through an island paradise and absorb the pristine beauty of Grand Bahama Island while you learn about the island's first inhabitants and catch a glimpse of what makes this island so exceptional. Get out of town and travel deep into the heart of Grand Bahama Island! 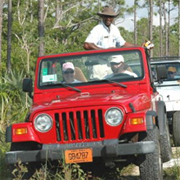 On this exciting jeep safari tour, you can discover the fascinating natural wonders and various ecosystems hidden in the interior world of the Bahamas. Get a great view of Grand Bahama Island on this exciting water-based tour. 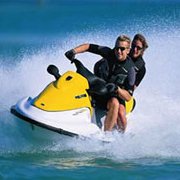 The speed and the versatility of a Jet Ski allow you to fully explore the crystalline waters and pristine beaches of this captivating island paradise.